Talking about putting up Audrey, they are all agreeing it’s the best thing to do. CLay – she wants people to pity her..
Austin thinks with jeff and Audrey out the two people playing a crazy manipulative game will be gone. Shelli says even if they don’t put up Audrey there’s bigger target than Jason and James in the house. Austin says he thought he was building a relationships with jackie but not any more. Austin says she was talking Trash about him. Austin – what would happen to Jackie if Becky wasn’t were.. They tell Shelli no prepping Audrey she has to be blindsided. Shelli jokes that she’ll be in the HOH hiding the entire week. VAnessa’s POV ceremony speech “I’m a straight shooter and I don’t like Liars” She found out about someone she gave a second and third chance to isn’t being straight with her and because of that she’s using the veto on Jason. Vanessa says Austin is 100% off the radar they are safe this week. VAnessa goes into the toilet stall. Vanessa back says Audrey is too sneaky to keep in the game. She’s going to try and include Liz and Austin with any deal she makes. Vanessa is going to make is later tonight. Vanessa leaves. Julia was nice to Jackie but Liz wasn’t. They are worried Jackie will put up Liz and Steve or Liz and Austin. They agree Audrey doesn’t do anything all she does is lay around and stare at people, Austin calls her boring. Clay understands why VAnessa is really gung ho with getting out Audrey. He’s gung ho about it as well. Clay says he cannot think of one thing that Audrey does for them. Shelli plans on cutting deals with people so they won’t put her and Clay up in the event they win HOH. lay thinks she should get a guarantee up to Jury. Shelli tells him if her and Clay ever win HOH again they will never put Jason up. Audrey scares him the most she’s his number 1 target Austin is his number 2. Shelli asks him if she puts up Audrey will he have the votes. Jason doesn’t think Audrey will have the votes, He only sees Austin as someone who will flip and vote out Johnnymac. Jason is says Audrey is probably not liked by the fans. Shelli tells him the entire house has to band together, Audrey is going to throw people under the bus and lie. Jason says Becky was personally offended by Audrey and Jackie will do what becky does. Clay – she’s (Audrey) a damn cat she’s got 9 lives..
Shelli says she gave Audrey another shot. Audrey is still making her time in this house so stressful. Shelli – I’ve asked her.. I’ve sat her down please just sit back.. She wants to talk about the nomination ceremony 7 weeks from now . 11:50pm JohnnyMac and Steve Chit chatting. Steve says he programmed his computer once to run a infinite loop to stress the CPU and produce heat. He placed the computer under his pillow to warn it up. Jason thinks this twin will be in the game for awhile because she has to learn the “wack street boys” dance. Jason would bet his whole game on there being twins. 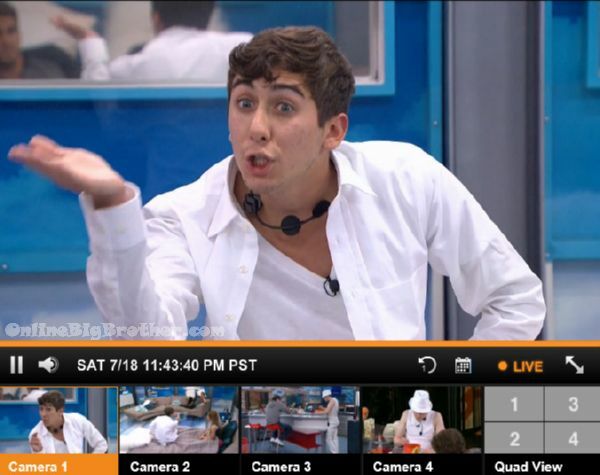 Adds especially because of what was said in his “Journal” (Diary Room) Feeds Cut..
Hush Jason. Stop telling people you think there is a twin. You are on the block. Hush!!!! If you stay quiet, you might be safe. If you keep running your mouth, you might be in trouble. That’s exactly what dumbasses don’t think about. Keep the target in the house. Production will somehow have a “non-eviction” this week. That’s why there hasn’t been a takeover twist this week. Oh Audrey’s nominated?? SURPRISE!!! No eviction this week. They already know she’s going to try to blow up sleeper cell, the beauty of it is who will believe her? The only reason I want Audrey to stay is that she is the one capable of taking Vanessa and Clay out of the game. Jason’s comment about Liz, Austin and Vanessa not taking out Audrey makes me think, he really doesn’t know much about what’s going on in the game. So any bets audrey gets the diamond pov soon? My concern is that there has been no twist announced for this week. If Shelli does backdoor Audrey, are they going to come up with something last minute to keep her in the game? I think Shelli is expressing sincere concern for Audrey’s mental health, and I don’t believe it is healthy for her to subject herself to the stress of Big Brother. YOU ARE A BIG DUMBASS!!! Vanessa blows!!!! J Mac and Becky for final 2. Yeah baby !!!! I’m a little concerned production will do something to keep Audrey in, but Jason has a point; she hasn’t been getting a phenomenal edit. Fans seem to like Johnny Mac and Jason more than her, plus it’s not as though she is getting evicted because she’s transgender. Maybe they won’t do anything to stop her eviction. Anyone watching this season would understand why she was booted. I guess that probably won’t stop Buzzfeed from writing some article about it though.